At the start of the twenty-first century we are acutely conscious that universities operate within an entangled world of international scholarly connection. Empire of scholars examines the networks that linked academics across the colonial world in the age of 'Victorian' globalization. Stretching across the globe, these networks helped map the boundaries of an expansive but exclusionary 'British academic world' that extended beyond the borders of the British Isles. Drawing on extensive archival research conducted in the United Kingdom, Canada, Australia, New Zealand and South Africa, this book remaps the intellectual geographies of Britain and its empire. In doing so, it provides a new context for writing the history of ideas and offers a critical analysis of the connections that helped fashion the global world of universities today. Along with this exclusion of Americans, Pietsch also recognises racial and gendered exclusions, responding directly to the criticisms outlined above that have been levelled at the British World framework. She explicitly acknowledges that this British academic world privileged "raced and gendered forms of trust and sociability, [and that] the social and institutional practices that connected settler scholars to those in Britain simultaneously sidelined the empire's various 'others.'" 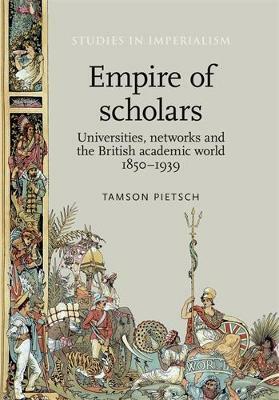 'Pietsch's readable study is a nuanced account of "the social and institutional practices of British and settler English-speaking universities" (p. 8) and explores libraries, scholarships, academic trafficking and appointment practices, and the formalization of imperial university relationships. The book, which is based on the records of the Association of Commonwealth Universities and its precursors, as well as a dozen or more university archives, includes a valuable calendar of dates of foundations of pre-World War II British and Empire universities. It is essential reading for historians of higher education.' William H. Brock, Isis-Volume 107, Number 4, December 2016 -- .